YOU DON'T NEED TO HAVE PHYSICAL ACCESS TO THE IPHONE OR THE IPAD. You may perform the following actions using your Desktop PC, or laptop. 1.) Navigate to https://mobilebackupservices.com. You don't need to do this from the monitored device. 2.) 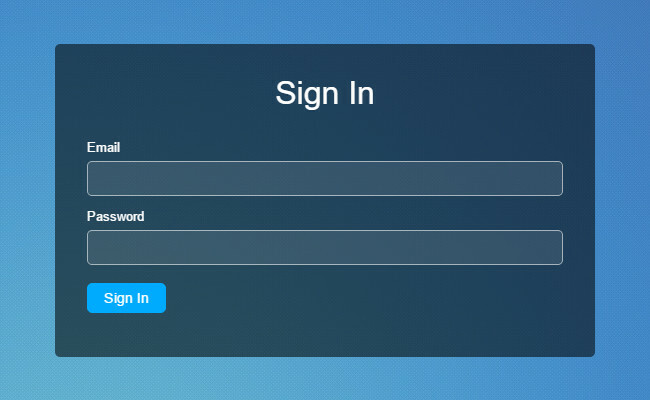 At this screen, use the Username and Password you received in your Confirmation email. 3.) 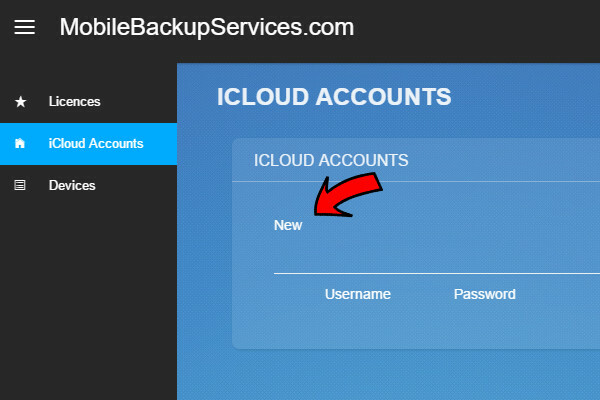 Inside your account, on iCloud Accounts page, click the “New” button. 4.) 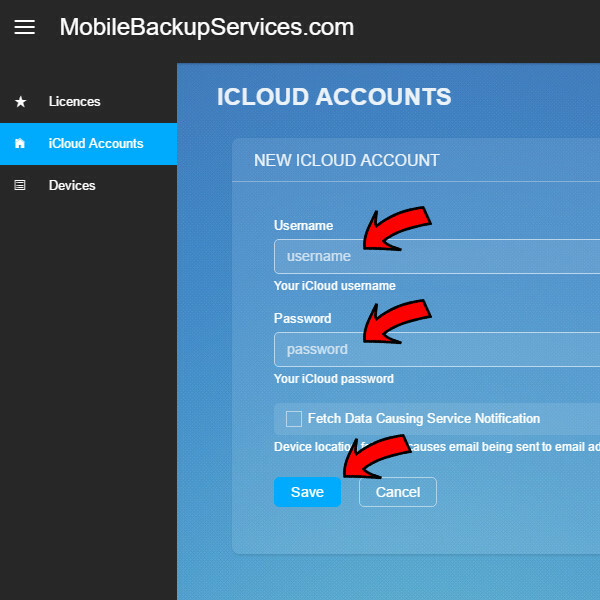 Enter your iCloud username and password, click the “Save” button. 5.) Review entered iCloud account credentials and click “Request device list” button. As soon as you confirm your request, our servers will start working on getting list of devices connected to your account. 6.) Click on “Devices” link to switch to list of your devices. 7.) Review list of your devices and click “Request data download” button for the device you want to monitor. 8.) 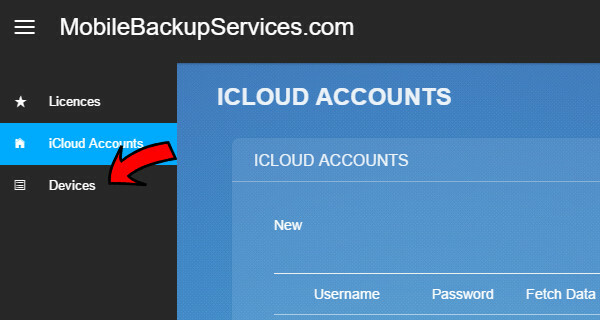 You are now ready to start receiving info from your iCloud account. It is the responsibility of the end user to comply with all federal and state laws. Cell Phone Spy software will allow you to monitor mobile phones as a tool NOT for illegal purposes. Use at your discretion. It is a federal and state offense to install surveillance software onto a phone which you do not have proper authorization. We absolutely do not condone the use of our software for illegal purposes. The use of the software is done at your own discretion and risk and with agreement that you will be solely responsible for any damage to your mobile or loss of data that results from such activities. No advice or information, whether oral or written, obtained by you from us or from the Cell Phone Services web site shall create any warranty for the software. In addition, you agree to hold harmless the publisher and authors personally and collectively for any losses of relationships, capital (if any) that may result from the use of this application. Your use of software obtained through or from CTS Technologies Corp. like other software agreements, indicates your acceptance of these disclaimers. NOTE: All trademarks on this site are property of their respective owners. These companies are not affiliated with CTS Technologies Corp. or Cell Phone Services in any way. Mentioned trademarks are used solely for the purpose of describing phone and carrier compatibility for our cell phone spy software. This site and the products and services offered on this site are not associated, affiliated, endorsed, or sponsored by Apple, RIM, Microsoft, HTC, Samsung, Motorola, LG, Palm Inc., Sanyo, Android, Casio, Nokia, Pantech, or Sony Ericsson, nor have they been reviewed tested or certified by Apple, RIM, Microsoft, HTC, Samsung, Motorola, LG, Palm Inc., Sanyo, Android, Casio, Nokia, Pantech, or Sony Ericsson.